Okay, no weird color halos on this cover, yay! I really liked the artwork on this cover! Her serious expression, the sense that something is a secret, and his playful expression really appealed to me. And hey, I admit that I like series with “Chocolate” in the title, though there isn’t really much of any chocolate in the actual story 😀 This comic is a Ribon Mascot comic, so I doubt it will get smutty. 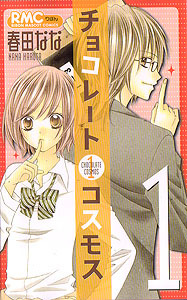 Instead, this is a cute and humorous romance.This is volume 1, and really look forward to reading future volumes! The heroine of Chocolate Cosmos, SAKURAI Sayuki, is similar to the heroine in “Kimi no Kiss de Furete” in that she is also out to find a destined, devoted lover. She dreams of a boyfriend. However, unlike the heroine in “Kimi no Kiss de Furete”, Sayuki is not quite as cute and cheerful and easy to like. In fact, even though Sayuki is very honest and earnest about her wish for a romantic school life, she ends up scaring people away instead of winning their hearts. Sayuki is strong and forceful, but her face is also very serious and stern. She never smiles, and her expression scares boys away before they can get to know her cute side. This is frustrating for Sayuki, who sees the months go by and none of the typical romantic relationship things happen to her. Fortunately, she does have some friends among the girls in her class, and during the summer break they drag Sayuki to the beach with them. Ever the secret romantic, Sayuki imagines a romantic meeting where she meets a handsome guy who likes her, and they discover they go to the same school, and they live happily ever after. Of course, the reality is that her friends have to pretty much hide Sayuki from the boys because her dangerous expression makes them uneasy and almost scares them away. Poor Sayuki. However, amazingly enough, her romantic dream of meeting a cute boy from her school actually comes true! His name is Hagi, and he doesn’t seem intimidated by Sayuki’s scary face. Sayuki is instantly smitten with him, and they have a lot of fun talking and painting their fingernails (don’t ask…). Hagi is struck by how cute Sayuki’s smile is after they chat for a while and she relaxes enough to smile freely. Sayuki thinks Hagi looks really familiar, and asks if he goes to her school. When he admits that he does, she couldn’t be happier! He is a bit secretive during their chat, which only makes Sayuki more determined to meet him again at school. Sayuki’s crazy romantic school life is not going quite as planned. But she still has feelings for Hagi. Is there any way this can work out? ?